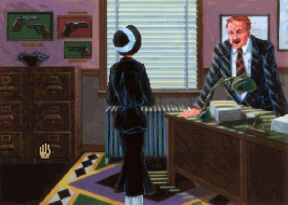 Laura first graced us with her presence in 1989, the product of the development stable that launched the very concept of graphic adventures. Beginning life as On-Line Systems, Ken and Roberta Williams delivered Mystery House in 1980, the very first computer game with graphics. 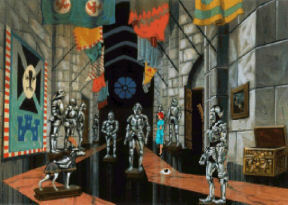 Nine years later, after a highly successful period which spawned most of Sierra’s well known series, Laura emerged, a somewhat re-imagined version of that very first game. While we have become somewhat immune to the extraordinary pace at which technology leaps ahead, it is still rather remarkable to see how much things changed in such a short time. Do some googling and see the graphic transformation for yourself, keeping in mind that until Mystery House, graphics didn’t exist at all. More than that, the Williams apparently had to manufacture their own graphics “engine”. Then look at the difference between these two games, only four years apart, and be somewhat impressed all over again. Both games have inhabited my boxed collection for some time, but I never played either of them. Now thanks to GoG we get an opportunity to do so. I played them simultaneously, and for a variety of reasons am reviewing them as a package. As is always the case when I play these old games I get the boxes and all the content out and have them ready at hand. I am a fan of downloadable games and what technology has done for the genre, especially around indie developers, but there remains a certain attraction for the boxed version with its feelies and assorted paraphernalia. And a good thing I did, as Colonel’s Bequest starts with a bit of copy protection that requires you to match a fingerprint to one of the characters, a task completed by searching the back of your Misty Acres Plantation map with a red cellophane magnifying glass. Fail to select the right one and the game (then and now) dumps you back to the desktop, and it randomises each time you play. Goodness knows what you did if you lost your magnifying glass, but GoG has placed two variants of the necessary document in the game folder, so make sure to have a look. There is no such requirement with The Dagger of Amon Ra. When we first meet Laura, a southern Louisiana belle, she is a budding journalism student, invited by a friend to spend a night or two at her uncle’s mansion in the middle of a swamp. A dinner later, having heard the terms of Uncle Dijon’s will, the bodies start to pile up. The game sees Laura poking about, discovering more and more dead bodies, uncovering who done what, and leading to a moment of truth showdown at the end. 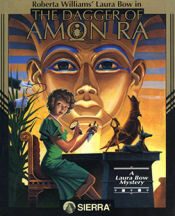 The Dagger of Amon Ra sees Laura arrive in New York for her first job as a real journalist. Her first job is to cover an Egyptian exhibition at a local museum, from which the main piece has gone missing. A ramble around town first, but once at the museum the bodies again begin to accumulate, and Laura may or may not see out the night in triumphant fashion. There are many similarities in these games, apart from the body count - an extensive part of both games takes place inside a single albeit rabbit-warrened building, you can die through a variety of actions, snooping and eavesdropping is your stock in trade, and characterisation is ordinary to say the least. Many characters are also dated stereotypes, occasionally verging on the tacky. Time is a factor in both, neither are easy by any stretch of the imagination, and both will take you a goodly amount of time to finish. Both offer replay value in getting a better outcome to the mystery, although each do the outcomes differently. There are also differences, apart from the advancement in technology. 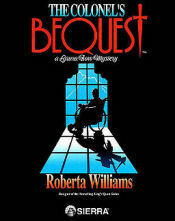 Most prominent among these is that Dagger of Amon Ra can result in dead ends only overcome by restoring an earlier save game, whereas Colonel’s Bequest allows you to finish, albeit with a less than exemplary sleuth rating. Roberta Williams also had far less to do with the latter, but that is by and large a sidebar. Both games are played in Acts, with time advancing as the result of certain triggers. I thought this was better handled in Colonel’s Bequest, despite the fact that I missed a lot of what went on. Simplistically, everyone else dances to the tune of their own drummer (I am listening to Linda Ronstadt as I write), and therefore events happen around you. Perhaps you are there to witness, perhaps you aren’t. It can lead to a disjointed narrative, but given that you can finish regardless (unlike a number of other games) it adds to the realism of the events. If two characters are talking about a key piece of information, then you need to be there to hear it. The downside is that there isn’t a lot to indicate that you had better be there at that time. Nor that you should be in the secret passage rather than in the room itself. In Dagger of Amon Ra I wouldn’t be surprised if not having heard a certain conversation or asking a particular question was fatal to finishing, but I can’t confirm this. It also felt a little haphazard. The maid and what she was doing was a case in point. It may have been me, but I don’t believe she could have been everywhere I found her if she was indeed responding to time. 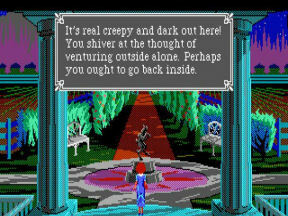 To some extent though that also happens in Colonel’s Bequest. Leave a room and walk straight back in and you can find the previously living person. Death becomes Laura in all sorts of ways you will never foresee. Sierra was known for this, and saving regularly is a necessity. Despite the frustration, many are worth experiencing for the death scene itself. The shower scene in Colonels’ Bequest is probably the high point, but the over the top mouse trap death in Dagger of Amon Ra isn’t far behind. And being eaten by beetles has its own charm. Some of the deaths of the other characters are also rather creative. As far as other aspects are concerned, I could well have done without the chase scene in the latter part of Dagger of Amon Ra. You either get away from the assailant by doing a large number of things that will likely be the result of dying regularly, assuming you have the items you need, or you fail. I confess to resorting to a walkthrough to get through this part, and would still be trying to work out the sequencing without it. I also found the way in which you use the notebook in Dagger of Amon Ra to discuss topics way too fussy – click the "question mark" icon on someone, this brings up the notebook, pick a section, choose a topic, right click to change to the "exit" cursor and left-click again to exit and ask. You do this each and every time for every topic, of which there are many, magnified by the number of characters. It was way too laborious, and made me almost hanker for the text based input of Colonel’s Bequest. 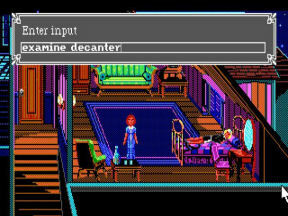 Speaking of which, given its vintage you need to type text commands in order to do things in Colonel’s Bequest, although a series of shortcuts can assist (e.g. “control L” will launch the text string “look at”). You can also point and click Laura around the place, if a little cumbersomely, and you can also right click to look at items. I thought it worked well, even if it took me a little while to get the hang of the verbs (you don’t “take” a shower, you “use” it). By the time we get to Dagger of Amon Ra, a ribbon of icons enables you to choose the relevant cursor for the action you want (look, walk, use etc), each with a nice Egyptian flavour. You have spoken word in the later game, although you can choose to play without it. You have to read everything yourself in the earlier game. Both are in colour, and while there is some sound in Colonel’s Bequest it is relatively and comparatively silent. You can also tweak some settings in both games, and I would recommend upping the speed at which Laura walks around the place. The plot in both games is rather silly, if not generally then certainly in parts. There is though some witty (and risqué) dialogue, a plethora of interesting pop up information when looking at objects, and much to observe and do outside the way forward in each game. The Colonel’s Bequest even has a completely unnecessary treasure hunt in the gardens outside the mansion should you be so inclined. A lack of things to do and see is not a complaint you could make. All in all, I preferred Colonels’ Bequest, but I doubt I will play either again to try and improve on my rather parlous results. Call me soft, but there are reasons why some things aren’t features of games these days, and too many aspects, in dagger of Amon Ra in particular, were more of a chore than a pleasure. Nonetheless I am glad I got to see them, and will continue to play these oldies for as long as GoG keeps bringing them out.